As banks across the world teeter amid the market meltdown, Americans and Europeans watch their governments intervene to stave off catastrophe. But for the 301,000 citizens of Iceland, the slide is more like a free-fall, as the tiny country finds itself engulfed by massive debts that have spun out of control in a matter of weeks. Iceland's currency, the krona, has plunged about 30% against the euro in just 10 days  and has lost more than half of its value over the past year. The declining krona has caused sharp spikes in the price of essential food and fuel imports to the remote nation, with the country's dwindling foreign exchange reserves and the collapse of some of its key banks raising questions about Iceland's ability to service its foreign debt. This week, the government put the country's second-biggest bank, Landsbanki, into receivership  effectively declaring it bankrupt  and poured 500 million euros ($682 million) into the country's biggest bank, Kaupthing. 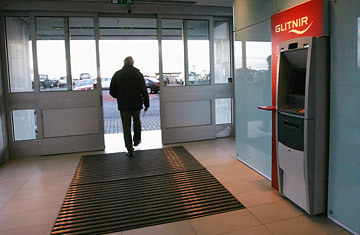 The move followed the nationalization of Iceland's third-largest bank, Glitnir, on September 29. On Monday, the government also suspended trading in the biggest financial institutions, while it negotiated sweeping powers for itself to take control of financial institutions, transfer bad mortgages into the publicly backed housing fund, and persuade trade unions to return their foreign pension-fund investments to Iceland. Officials in Reykjav�k have good reason to be spooked: Iceland's banks, which account for most of the country's stock exchange, have ballooned so rapidly that their assets  more than 80% of them being foreign holdings  had been, last month, worth more than eight times the country's GDP. Iceland, in other words, was betting very heavily not on its own economy, but on the economies of others, and when financial markets began to tank last month, setting off a global avalanche, Iceland was more cruelly exposed than most. The pain was instantly felt among ordinary Icelanders, suddenly forced to contemplate the rapidly rising cost of car, home or student loans. Some Icelanders complain that their country's bankers became too rich too fast, embracing global wealth with little discipline or foresight about what they would do if the economy turned sour. "They went everywhere and did everything," Hallgrimur Jonasson, the chef at the Hotel Reynihlid in northern Iceland told TIME on Wednesday, one day after Prime Minister Geir Haarde went on television to assure the nation that he was "saving the domestic banking system." To Reynihlid the banks did not deserve saving. "If I need money I have to come up with guarantees and names to back me up," he says. "How can these people go around without guarantees?" The same question was being asked in London, where customers of Landsbanki found their funds frozen on Tuesday, and where Icelanders were seeing the rapid shrinking of their savings. Bergur Finnbogason, 26, arrived from Reykjav�k in mid-September to study architecture at the London Metropolitan University. The plummeting of the krona against the British pound has ballooned the size of the student debt he'll have to repay Iceland's government for his tuition in Britain. "I'm starting to look for a night job," he says. "Things are really tough." Icelanders have long prided themselves on their grit, essential for survival on a remote volcanic island devoid of lush forests or fertile prairies. "We lived in this country for 1,100 years, desperately poor, in a very harsh country, fishing in open boats in the worst weather," says Kari Stefansson, an Icelandic neurologist and former Harvard professor who returned to Reykjav�k 12 years ago to found a company that has mapped the DNA of most adults in Iceland. Stefansson says he believes Icelanders "do better when times are difficult than when times are good." But in recent years, times have been very good. An explosion of new wealth, created largely from record-high world prices for fish and aluminum exports, transformed Iceland within a generation into a country which "adored the immensely wealthy," says Stefansson. He says many now believe the current economic implosion will ultimately benefit Iceland. "We will return to old values by focusing on things which create real value." Right now, however, Icelanders' priority is coping with the meltdown. On Wednesday, government officials flew to Moscow to negotiate a 4-billion-euro (about $5.44 billion) loan offered by the Russian government, perhaps in part to forge closer ties with a long-time Western ally. "For Russia to prop up a NATO country which is in dire straits is a P.R. coup," says Karl Blondal, editor of the Reykjav�k newspaper Morgenbladid. Russia was not Iceland's first choice, of course  it turned to Moscow only after European countries and the U.S. turned down its appeals. The rebuff stung many Icelanders, whose government backed the U.S. invasion of Iraq in 2003, and until last year hosted a U.S. military base in Iceland. Says Stefansson: "At a moment like this, one needs help."